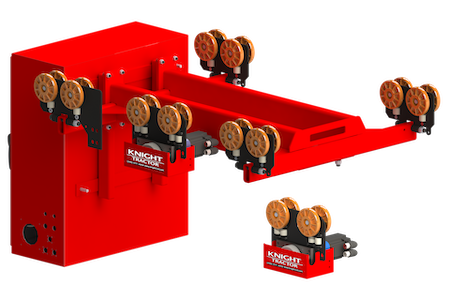 Knight’s Servo Tractors are designed to accurately locate, push, tow, lift and position loads from an overhead rail system. Tractors significantly reduce the push/pull forces as well as the energy to sustain movements. 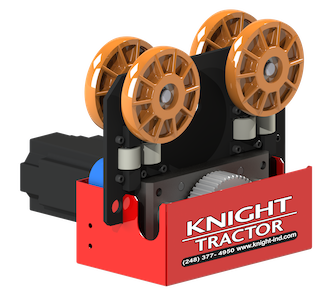 These Servo Tractors are equipped with Knight’s (IAD) Intelligent Assist Device Servo Technology, allowing them to provide controlled transfers of workloads with speed and precision. 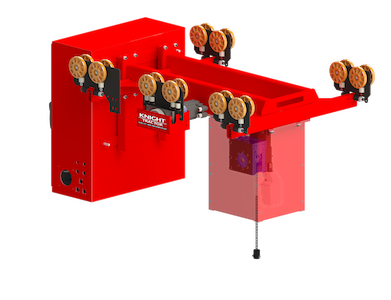 They can be programmed to automatically or manually move and stop the runway at intended locations with repeatable accuracy while lifting loads at the same time; thus eliminating unnecessary operator motions. They can also can be programmed for assembly line speed synchronization. 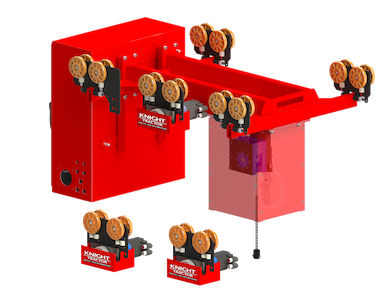 The KST4000 Rack and Pinion Servo Tractor offers a continuous contact non-slip rack and pinion design. This continuous non-slip design allows for a more accurate positioning of the load. 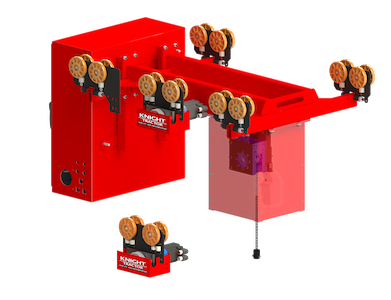 Movement of the Servo Tractor is controlled by a two speed pendant, and can be programmed for multiple positions. Variable Maximum Speed: Up to 174 ft. per min. [53.2mpm]. Maximum Towing Capacity: Up to 4,000 lbs. [1,814.37kg]. Maximum Lifting Capacity: Up to 1,000 lbs. [453.59kg]. Non-Slip Rack and Pinion Drive System. Power and Free Drive Wheel. Chain Lengths, Unlimited (18 ft. Standard). 240VAC, Single Phase, 50/60 Hz. – (8) Inputs/ (4) Outputs are free for interface controls.